I discovered Wovenplay, through Jess Brown (she joined them for her limited edition dolls). 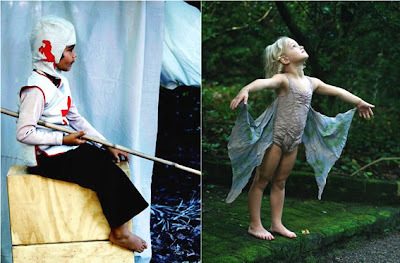 , Wovenplay is a line of imaginative children's play clothes inspired by nature, arts and crafts and music, based in Manhattan. Their collection crosses the line between clothes and costume encouraging children to play and wear pieces anyway they like for free creative expression. Their aesthetic is a mix of vintage, bohemian and children's books illustrations and their clothes are exactly what I think children's clothes should be, comfortable, made of natural fibers and most of all creative, so kids would love to wear them. Most pieces are either handmade or hand-finished, tinted in natural or low impact dyes, their packaging is recycled and/or biodegradable. This is something Neena should carry for sure, I will order a few pieces from their collection for the shop, although they are not cheap, they are worth every penny.